Newway Towing in San Rafael provides complete range of towing and roadside assistance services through an affiliate network of independent tow truck operators, delivering fast and professional service. Our expert technicians have the training and experience to work on vehicles of all makes and models. When you pick up the phone and call on us, rest assured you’ll receive only the best service at the most competitive prices from a reliable, licensed firm. Newway Towing – We are Here to Take Care of You, 24/7! As you can see, we’re here to help you in any situation you find yourself in on the road. We service all cars, trucks and motorcycles, across all brands. All of our technicians undergo in-depth training and carry the most cutting-edge equipment. On top of that, We keep every single truck well-maintained for maximum performance and safety. We take the security and condition of your vehicle very seriously: we’ll ensure your car, truck or bike is fully secured while being towed. This is vital for the safety of your property, our drivers and everyone else on San Rafael’s roads. If you want to know more about any of our services, please don’t hesitate to give us a call! We know 24 hour service is essential today. We all lead busy lives and you may not keep the same hours as everyone else. Perhaps you work night shifts. Maybe you like to go biking late when the roads are clear. Whatever your lifestyle, accidents and mechanical faults can strike at any hour. Your tank might run out of gas in the middle of a crowded highway, your tires may blow on the way to the office or you could even lock your keys in the trunk at the most inconvenient times. 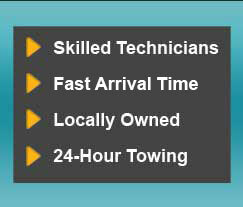 Newway Towing’s professional team is dedicated to helping you get back on the road and on schedule round the clock. Just call us whenever you need us and we’ll be here. Newway Towing is a local licensed towing and roadside assistance company. Our technicians are part of the local community, which gives them the in-depth knowledge of the area they need to reach you quickly. We believe in building lasting relationships with our customers in San Rafael. Newway Towing strives to give you the friendliest, most transparent service in all situations. No job is too big or too small: whether you just need a tire changed or your gas tank refilled, every single call is important to us. Newway Towing’s competitive pricing means all our rates are reasonable and affordable for drivers on all budgets. We know how frustrating having to find the money to have your vehicle towed or serviced can be. We know every cent counts. That’s why we work hard to keep our costs as fair as possible. There are no hidden charges for you to worry about either! Have any questions about our services in San Rafael? Need help from one of our technicians? Call us on (415) 870-3377 now!